Bacchus only knows how much to-and-fro business has gone on between Australian wine leaders and politicians and the authorities and wine buyers of China in the last fortnight. Since I first wrote of this, the intray has fizzed with triumphant PR from the winemakers who went to Hong Kong for Vinexpo. But trade wars and rumours of trade wars have been rife on the home front, where such things tend to be given a different level of public reportage. Within hours of sending a billion-dollar quiver through Australia’s politicians and wine operatives, this specific threat was removed. It was replaced by a softer tone, still loaded with condescension, but calling us “Aussies” instead of “Australia”. Underlined by a wharf slowdown, still to be accurately measured or reported in litres or money, the message had done its job. Even the ousted Australian Border Force boss, Roman Quaedvlieg, a self-professing “geo-political dilettante” who has “fought crime a lot” and knows “a little about border security, national security and trade issues”, entered the fray. “In the age of free trade architecture, Single Window trade processing, blockchain, cognitive AI computing, high-speed barcode scanning and automation, the old school non-tariff barrier (NTB) of ‘go slow’ works a treat to put instant, precise and painful pressure on trade flows,” he tweeted. 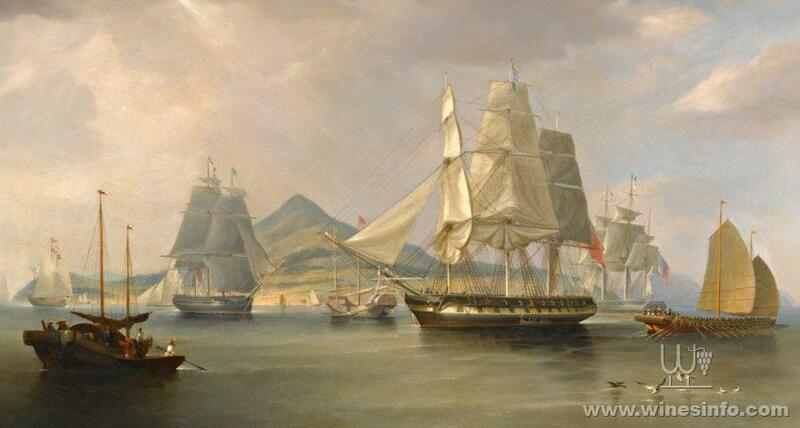 While reluctantly mentioning the Opium Wars, which some Chinese regard as happening just a few years back, I suggest Quaedvlieg knows a lot more than most of us about the drug trade, given his Border Force experience. These current political realities, whether actual or dreamed, seem slightly less sinister than the wars and rumours of fair dinkum hot-shooting Trumpian wars with dead people. There are fewer horrid photographs, to start with. But of course the two are entangled increasingly as tariff and blockade threats and counter-blockade threats twist and turn. It was revealing to see federal Trade and Tourism Minister Steven Ciobo sagely advise the National Press Club yesterday that only one – count ’em: one – winery had met with him for assistance in clearing the backlog of Aussie booze building up on Chinese wharves. It remains to be seen whether this was to get the Grange and Bin 707 flowing or wine more along the lines of Murray-Darling stuff. A short fortnight ago, China began putting long-range nuclear bombers and missiles onto the islands it’s built in the South China Sea. This triggered and/or coincided with much tone-deaf trumpeting and missile-rattling from the White House. Not to mention India joining our western allies’ war games in the oceans to our north. Which in turn followed a gradual stewing of Australian discontent about the Communist Party of China attempting to unduly influence our way of life, beginning in our hallowed halls of academe: the brain farms our government has defunded to the point that they exist largely on selling retail education to Chinese folks. All this while the Australian wine councils began to learn what it means to offend important Chinese, like those morally and politically miffed by Senator Anne Ruston’s statement – on April Fool’s Day – that Wine Australia would now decide who was a right and proper person to export Australian wine. “There will always be unscrupulous people seeking to make easy money from reputations carefully established and built by legitimate Australian wine producers and exporters,” she said, avoiding mention any particular nation. China knew who she meant. 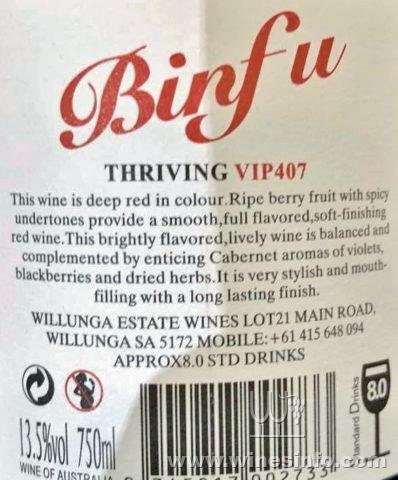 This was intended to put a stop to the sort of counterfeiting I’d blogged about in March: exporters like the mysterious Willunga Estate Wines, Lot 21, Main Road, Willunga (since gone), who put BinFu Thriving VIP407 on Chinese shelves, wearing livery that even some Australians could mistake for Penfolds. That was obviously a McLaren Vale wine address. While it seems to me that direct Chinese investment in Australian wineries and vineyards is concentrated in our most famous and profitable vignobles, Murray-Darling operatives have been excited to report that their troubled region is seeing vineyards sell for three or four times the amount they were getting just a few years ago. They see, hopefully, these prices increasing as China drinks more in the long run. Which is about as short-sighted and unreal as talking of drought in the past tense, which they do. The Australian Department of Agriculture and Water Resources forecasts and reports show that the current drought covering much of the Murray-Darling will only worsen and temperatures are increasing. Given the confounding chaos of the administration of water flows and irrigation permits already extant in the Murray-Darling Basin, can we be so naive as to imagine we can continue planning the export of big irrigation wine at about the cost of bottled water? While the Coorong and the estuary dies? As South Australia’s own Senator Ruston, Assistant Minister for Agriculture and Water Resources, is a died-in-the-wool Riverlander, maybe we should begin to expect her or her boss, Minister David Littleproud, to finally relate their highly-contentious Basin management plans to the drought forecasts their department dutifully releases. Maybe then they could have a bit of a chat to Trade Minister Ciobo and let us know whether all this fuss is largely to do with Australia selling vast amounts of inland water we don’t have to China, at 14.5 per cent alcohol? What does this really cost, or earn for Australia? And China, for that matter … is that vast nation’s water shortage the main handicap on the expansion of its own giant wine industry?